In an article published on Center for Security Policy, written by Caitlin Anglemier, The National Iranian American Council (NIAC)’s usual approach in serving as Iran’s lobby in Washington D.C. has been highlighted. Excerpts from this article are published here to describe the path the Iranian lobby and fellow travelers are talking while we are getting very close to the June 30th self claimed nuclear talks deadline. 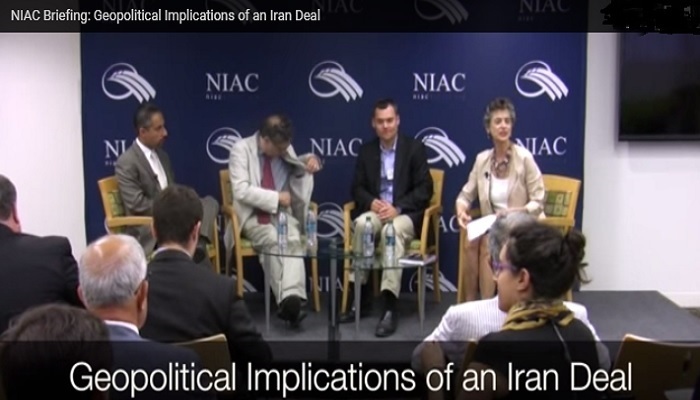 On June 25, NIAC held a discussion on “The Geopolitical Implications of an Iran Deal”. The panel of speakers included: Peter Beinart, contributing editor for The Atlantic and National Journal; Fred Kaplan, war stories columnist for Slate; Dr. Trita Parsi, President of the National Iranian American Council; and Barbara Slavin, South Asia Center senior fellow for the Atlantic Council, known within the Iranian community for appeasing the mullahs. In her article, Caitlin Anglemier reports: “The talk began with a discussion on how foreign policy has become a primary focus of the Republican party and how generally, the Democratic party tends to place more emphasis on social and economic issues. The discussion then drifted towards discussing the negotiation talks themselves and the ten-year time period aspect. The panel acknowledged the concern that many have, which is that the ten-year period is just delaying the inevitable truth that Iran could obtain a nuclear weapon within a year. But the panel emphasized the importance of those ten years. While that negative viewpoint is out there, why not try to focus on the time positively and the opportunity it provides for even more talks, negotiations, and compromising? It is also a fact that a big chunk of Iran’s economy is in the hands of IRGC, which is the main force behind all the nuclear activities, Regime’s meddling in Syria, Iraq, Yemen, etc (the Quds force), and therefore it goes without saying that all the money that will return to Iran will be channeled in the same manor it did before. Referring to the questions about the the exact details of the deal talks and their implications, she writes: “More importantly, even if we were able to compromise and establish a negotiation with Iran on their desires and demands, we have no reason to believe that they will be honest and follow through on said demands in the future. Therefore, this essentially indicates that a “deal” is just a blissfully ignorant façade. Conclusive, the discussion was polite, peaceful, and very informative. It would be easy to imagine a listener walking away with a positive mental image of Iran and the extensive benefits a successful nuclear deal agreement. However, we must take it upon ourselves to not be so easily deceived. Pursuing an agreement with Iran in nuclear talks is not only a waste of time and resources, it would result in directly providing Iran with significant relief from sanctions as well as billions of dollars. And contrary to what some apparently believe, these billions will in fact not be used towards benefiting the wellbeing of the Iranian citizens, but will continue to be used in funding terrorism and terrorist organizations.